Debra Rapoport, visual/performance artist and hat maker HERE and regular on Ari Seth Cohen’s blog Advanced Style HERE traveled to Denver with her partner Stan Satlin for the opening reception of Susan Wick’s show at the Boulder Museum of Contemporary Art, “Wild Women Never Get The Blues.” Susan’s show was featured on my post of last week HERE. Together we decided to organize two events to take place during the time of her visit. Hence, the “Cuffs” workshop was born! For the event Debra wears a hat which she created from Viva paper towels and a thrifted sweater, accessorized by handmade and thrifted pieces. I’m wearing Denise, a hat designed and created by Carol Markel, blogger, artist and milliner extraordinaire HERE, accompanied by estate sale pieces. On Friday, October 2nd, we were ready to roll, with 20 creatives from the Denver area. Though all participants were equally important and appreciated, I will be identifying and linking to those who currently have websites. “As a visual/performance artist, working with found and non-traditional materials, my work is about embellishments for the body. This transcends fashion into personal style which reveals your individual strengths. My hat creations are the place I start. I believe it is important to “Frame the Face,” our most important asset. I refer to my work as my A/B/C’s. Assembling, Building, Constructing for the body. The event was co-hosted by my friend Carolyn Fineran HERE, and the workshop participants were excited, focused and eager to learn new skills. My dear friend Sarah of Sarah Ashford Studio HERE generously offered her studio space for the event. Brooks Luby, second from left HERE, is a longtime Denver fashion designer and Janine Gastineau, second from right HERE, is a singer who will be launching her new solo CD at Dazzle Jazz on November 8th, 2015. Debra is in action, as she offers personal attention and direction during the event. You could hear a pin drop, as everyone present was focused on their cuffs made from toilet paper rolls, inhaling the gifts offered by a master artist in residence. Long time friend and celebrated Denver artist Lonnie Hanzon HERE and Debra intently collaborate regarding possible embellishment materials for cuff design. In the foreground of the photo above, Karyn Loving Schiele of the Loving Ewe Boutique HERE, which features her felted hand knit accessories, works on her cuff. Karyn will be selling her creations at the Cherry Arts Festival HERE in Aurora, CO on October 23 – 25, 2015. As the workshop came to a close, several of us posed with cuffs proudly displayed. On the left, artist and mental health advocate Diana Roca HERE expresses herself beautifully for the camera. As many of you may remember, Diana was the photographer for Style Crone for two years, beginning in 2012. On the right, Carolyn Fineran, event co-host, cracks jokes to ensure our smiles remain intact. Lonnie displays his completed cuff in the photo above. The “Cuffs” workshop was a huge success, with many requesting a return appearance by Debra in the future. We will have to work on that! Time with Debra always includes a thrift shop experience. In the photo above, Debra models the sweater and faux fur piece discovered at the Assitance League of Denver HERE, not far from my home. The thrift shop staff got into the action, admiring our choices and offering assistance, until we left happily with purchases in hand. Debra and her partner, singer and songwriter Stan Satlin HERE, appear radiant in their thrift shop apparel. Debra is wearing another Assistance League find in the photo above. The feather neckpiece can be worn in a multitude of ways, and was her accessory of choice as we were about to enter the Goodwill store HERE on Denver’s South Broadway, famous for its antique shops, local boutiques and restaurants. Debra is holding a flyer which we offered to everyone we met, which served as an invitation to our second event below. On Saturday afternoon we hosted a screening of Ari Seth Cohen’s Advanced Style Documentary HERE at Lannie’s Clocktower Cabaret HERE, which is located in downtown Denver. Lannie Garrett, proprietress of the Clocktower, talented torch singer and Denver icon generously offered her space for the event. Debra, one of the seven women featured in the film, wore another of her handmade Viva paper towel hats, along with thrifted, gifted and handcrafted pieces. As for The SC, where but Lannie’s could I wear a floor length silk velvet gown with silk velvet turban at one o’clock on a Saturday afternoon? The film was enjoyed by all in attendance and the Q&A which followed was spirited and compelling. Many questions were asked about “dressing up,” aging and creativity. The Advanced Style Movement made its appearance in Denver on a Saturday in October, and I’m sure that its life-changing energy with continue to grow and evolve as time goes by. Spending the weekend with Debra, Stan and Susan Wick was filled with fun, excitement, playful creativity and spontaneity. Thank you both for the unforgettable memories. 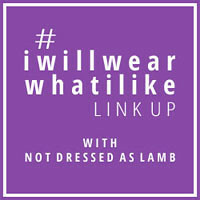 Linking up with Visible Monday HERE at Not Dead Yet Style, Shoe And Tell HERE at Style Nudge, and #iwillwearwhatilike HERE at Not Dressed As Lamb. I can’t believe how beautifully you wear yellow. And in red you are awesome! She’s a real artist!! You look fabulous in that gown and turban!! So very fun. Whoosh, is pretty much how I describe that awesome energy coming from the workshop. I love that Debra was able to extend her talents to local people with the generous assistance of Carolyn Fineran and you. You look comfortable on stage! I’m happy about the enthusiastic response to the film and one of its fine stars. A wonderful double event. What a lot of work to put together but so worth it, I think. Brava! Looks like so much fun! I really wish I would have attended all the events. What a wonderful workshop. Those cuffs are just stunning. WE need a whole POST on YOU IN that VELVET ENSEMBLE!!! WHAT FUN……..love the cuffs…………love her mottos embellishing THE BOD! THAT BLUE SCARF on her head in the thrift shop was STUNNING……..it was a scarf right?As I see it on her neck in another photo!!! THESE WOMEN with style and a sense of color are SO inspiring.AS YOU ARE SC! You and Debra are spectacular together! Looks like a wonderful workshop and your thrift store finds look incredible. I agree with the Contessa above, I want to see more of you in the velvet outfit – you look absolutely stunning! Really enjoyed the photos of all that went on. Debra seems lovely. Thank you for sharing Judith. What a fantastic event. I would have loved to join. The cuffs you all created are so good. The cuffs workshop is genius! All women, even us timid conservative ones, can feel the magic of creating such an accessory and actually wear it. What a wonderful week you have had. Thanks for sharing. The photos are great, wish I could have attended. Will get my group of artists together again to see the documentary! Love your style! You look so wonderful in all these pictures, it is truly inspirational! Your style seems to reflect your personality which is the whole point of fashion, and it shines through your clothes! Thank you! GREAT pictures of both of you – ALL of you – and WHAT A GREAT IDEA! I love the first photo of you and Debra! I have always wanted to attend one of Debra’s workshop so I’m envious. Everyone’s cuffs look so cool, and it’s nice to see Lonnie and Diana, whom I remember meeting during my visit. Your outfit for the film screening is Hollywood Goddess-worthy! You both look marvelous. Looks like you all had fun during her stay.